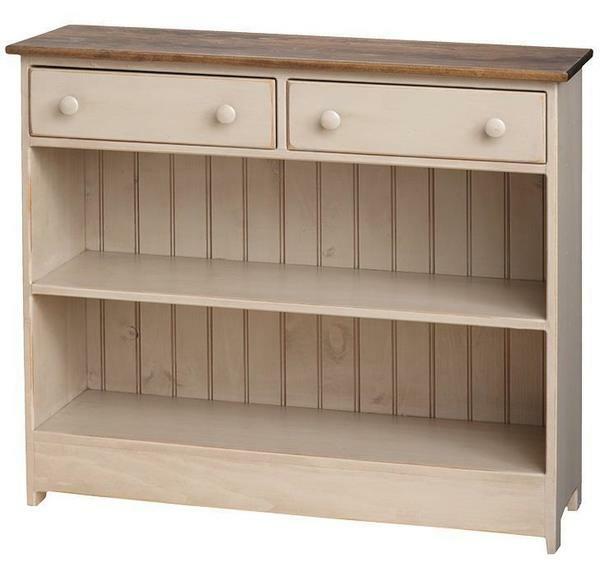 The Amish Pine Farmhouse Bookcase Hall Console is country and cottage style cute! This wood bookcase is made of eastern white pine, a softer yet stable wood that is high-performing for a lower price! For hallway or entryway, this console offers two shelves and two drawers for storage and display. Our Amish woodworkers are experts and handcraft pine wood into some amazing pieces of pine furniture. This bookcase is available with or without distressing. If you like a weathered look, distressing options from light to heavy are offered. You can feel confident in your online purchase with DutchCrafters. We are the leading retailer of Amish furniture online, with over 150 Amish woodshops throughout Pennsylvania, Ohio and Indiana. Please email or call us with any questions. Thank you for shopping with us.